Stability for maximum performance - Plama cutting up to 44 mm thickness possible ! 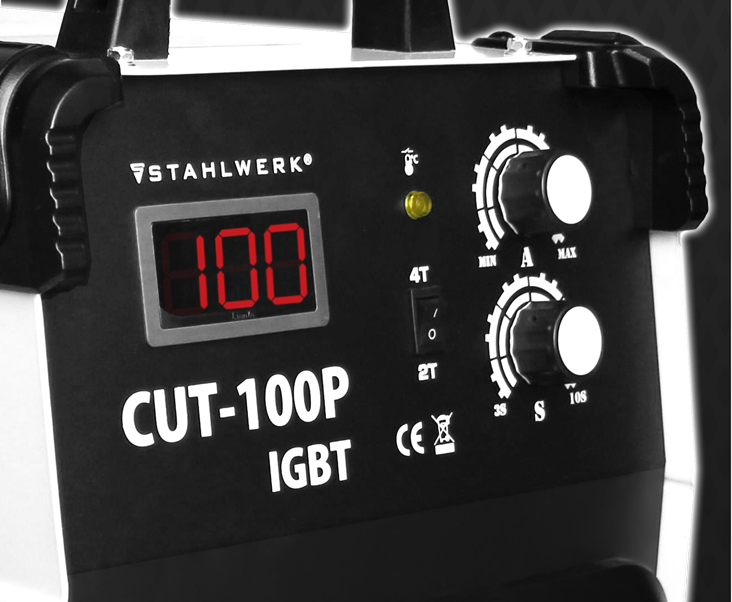 With the integrated Plasma Cutter CUT 100 P can be cut without problems all conductive metals. For example: aluminum, steel, copper, brass, titanium and so on. Cutting power up to 44 mm Material thickness (depending on material). V2a up to 32 mm, Aluminum up to 25 mm. CUT PILOT - Plasmatic sinus with pilot arc. With the switch 2T/4T the operating modes oft he control can be determined. This mode provides extended control over the current flow. IGBT Technology for all our ST models we rely on the powerful IGBT transistors, which are used in the power engineering of our ST devices. The advantages are high blocking voltage and robustness. The welding machine Plasma Cutter CUT 100 P has the most advanced inverter technology IGBT (Insulated Gate Bipolar Transistor). The resultant special features such as high speed and precision of the control give the devices their excellent quality in welding and cutting. - High duty cycle of 60% at 100 A. - CUT PILOT - non-contact pilot ignition. Aluminum up to 27 mm. 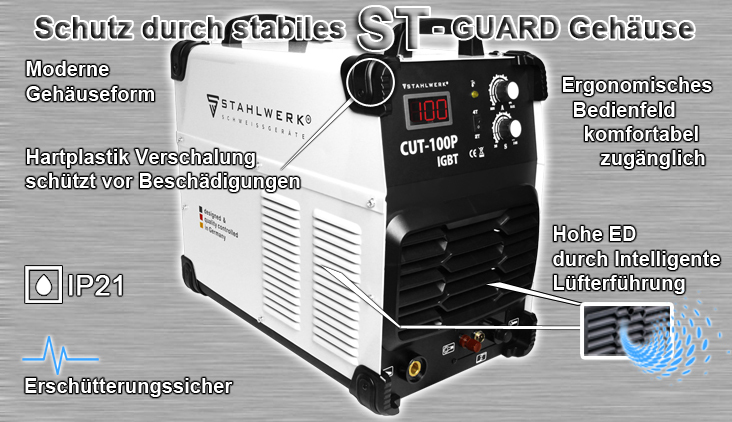 The machine Plasma Cutter STAHLWERK CUT 100 P IGBT. Plasma hose "P-80" 5 meter. Information for orders of machines with accessories: Depending on the ordered accessories, we will ship a second package with UPS. This is free for you. We want to avoid transport damage. Although both packages leave our house at the same time, in some cases, the machine comes first and the accessories are delivered one day later. This is not the rule, but it happens.